'Comedy for a Cure' is back! The Pearce Q. 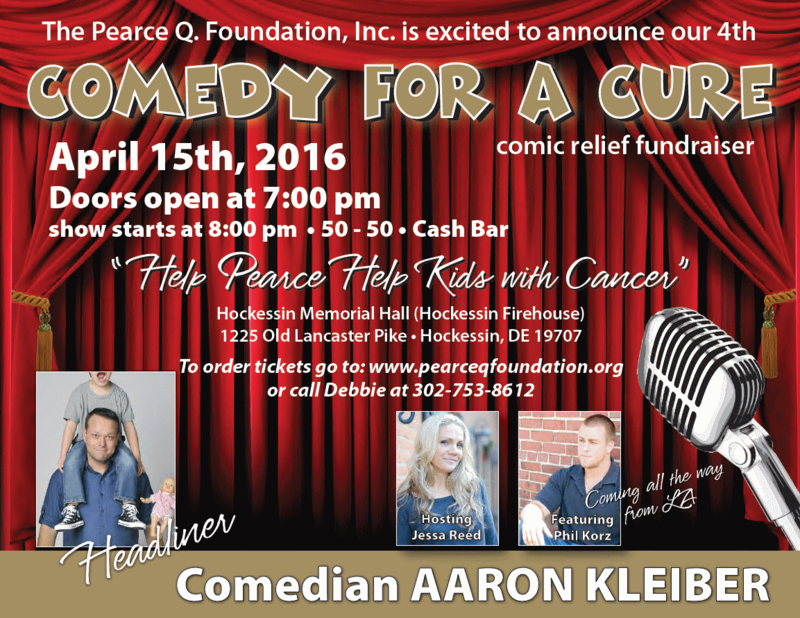 Foundation, Inc. is excited to announce our fourth ever “Comedy for a Cure” comic relief fundraiser. This is an 18 and over event to be held on Friday, April 15, 2016. Click here for details! Pearce honored on the SU2C Facebook page! Read the Digital Journal article. Read more about Pearce's work with Stand Up 2 Cancer! Pearce was featured in the Stand Up 2 Cancer event on September 7, 2012! Click here for a story about her appearance! Pearce was featured in the Stand Up 2 Cancer event on September 10, 2010! Click here to see video of her appearance! This is an 18 and over event to be held on Friday, April 15, 2016, at the Hockessin Memorial Hall (Hockessin Firehouse), 1225 Old Lancaster Pike, Hockessin, DE 19707. On-line ticket sales are closed, but tickets will be available at the door! Doors open at 7pm Friday night.